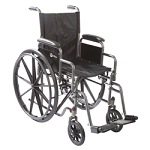 The Roscoe Heavy Duty Transport Chair features a black, reinforced steel frame that is attractive and easy to maintain. 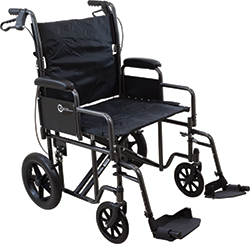 This transport chair comes complete with 12 inch rear wheels and companion loop style brakes that are convenient and easy to use. 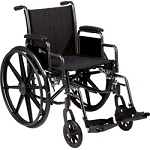 Black padded nylon upholstery is lightweight and easy to clean.The removable desk-length arms are padded for additional comfort. • Product Weight: 41 lbs.